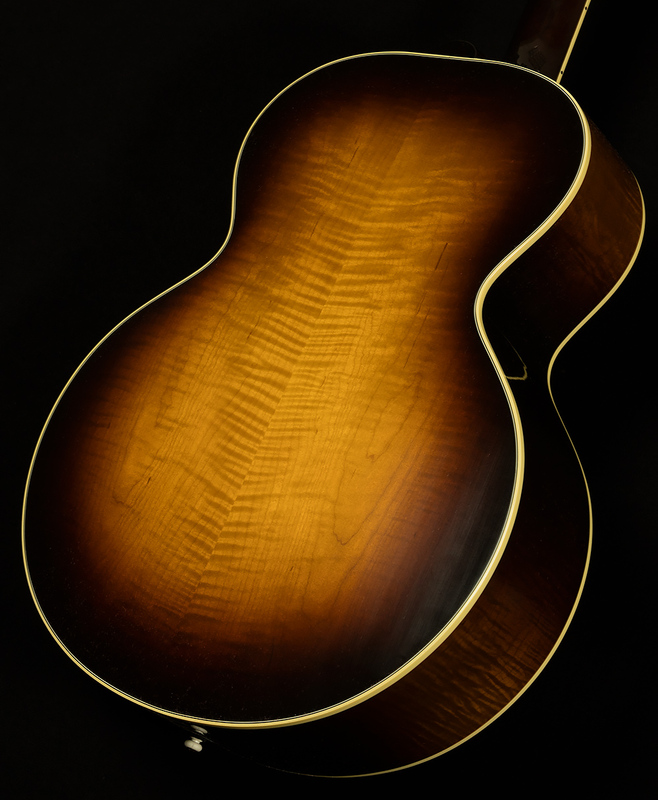 The Gibson J-185 is proof that guitars, like baseball, are a game of inches. When Gibson introduced it in 1951, they intended to offer flat-top lovers a jumbo guitar with a slightly different flavor from the J-200. So, they shortened the scale length from 25.5" to 24.75" and made the body slightly smaller. These two changes resulted in a guitar that sounded quite different from the vaunted SJ-200, so let's take a closer look and examine what makes the J-185 Vintage such a unique and delightful instrument. The J-185 and the J-200 both have spruce tops and mahogany back and sides, and they both are bigger than dreadnoughts, but that's where the similarities end. The biggest difference lies in scale length. The SJ-200's longer 25.5" scale makes for superb clarity and headroom when paired with the jumbo body. By contrast, the J-185's shorter scale makes for a more percussive attack with more note bloom afterwards, and a warmer, woodier timbre overall. To get more specific, the J-185 Vintage is one of the most delightful incarnations of this lesser-known model we've ever had the privilege of showcasing. Gibson really means it when they attach the adjective "vintage" to their guitars! 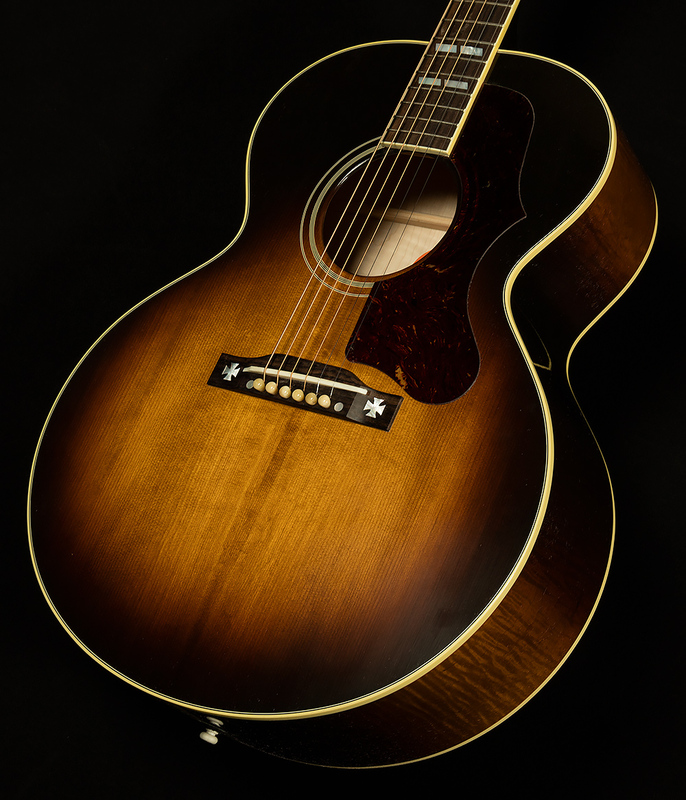 The J-185 features a thermally-aged Sitka spruce top for extra old-school Gibson mojo, and flamed maple back and sides for extra clarity and beauty. Together these tonewoods make the J-185 sound huge and piano-like, but with excellent clarity and note separation. Add in a comfy slim taper neck profile and a vintage-style finish, and you've got yourself quite a jammin' jumbo! We are proud to show off such an inspiring instrument, and we invite you to experience a deep cut from Gibson's storied history by taking the J-185 Vintage for a spin. We are sure it will be a steadfast muse on all your acoustic adventures!